Meet Timmy. Timmy is average in just about every way possible, except in height. Timmy is exceptionally short. Like, when I say exceptionally, I mean, CHILDREN have to STOOP to make conversation with Timmy. One time, he was baby sitting a three-year- old boy, and some kids at the park thought the boy was Timmy’s baby sitter. 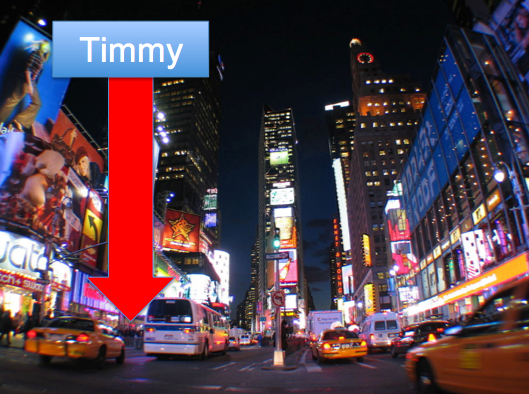 One day, Timmy decided to move to New York City to find true love. You see, he had lived on a farm in a one-horse town in Wyoming all his life, and he wanted to know what being in the city was like. (He also had had all the romantic success a one-horse town in Wyoming was ever going to offer. As in, he’d dated the one girl in the town he wasn’t related to for about six months). For a few days, Timmy really loved living in the city. He communed naturally with the pigeons and nobody tried to look him in the eye, so he didn’t have to face that constant reminder of how short he was. He was swept along easily with the fast-walkers of New York City, and the lights didn’t bother him because they never even reached his peripheral vision. But after several months in the city, Timmy still hadn’t found true love. The girls in Wyoming had always been very short, on account of inbreeding, but the tall models and actresses and CEOs of New York City never even bothered to glance down Timmy’s way. One fateful day, as Timmy was wandering through Tribeca, something touched his foot. Being very jumpy, Timmy freaked out (it turned out to only be a discarded napkin), but he freaked out nonetheless and flailed into a woman in front of him, hitting her purse with the tippy top of his head and knocking it out of her hand. Of course, when the purse fell from her hand onto the ground, a man, dressed almost entirely in black, ran by and snatched it up. Nobody gathered any identifying features of the robber, but one passerby who chased him on foot managed to notice one thing: the only non-black article of clothing he wore happened to be a pair of galaxy Vans. The FBI agents called in to investigate the case (apparently, the woman was high profile. Timmy wasn’t sure why, as he had never seen her face, and could only attest to the fact that she was very tall) were incredibly disheartened, as there was no way they could simply wander the streets, looking at everybody’s feet till they found a pair of galaxy Vans. But Timmy? It turns out, he was just the right guy for the job. He was given some special unit training for the FBI (including how to not jump at every single noise that startled him), and was sent on the chase. As Timmy wove his way through the crowds, searching for a pair of galaxy Vans, he became proud of his shortness for the first time in his life. It wasn’t long before Timmy found the purse snatcher, and his FBI cohorts successfully apprehended the man. It turned out to be the same guy who had been on the run after robbing Kim K in Paris! Timmy became an international hero! Kim and Kanye invited Timmy to work as their personal private investigator. It may sound like Timmy’s troubles were over, except he now had a difficult decision to make. You see, the tall woman whose purse had been snatched in Tribeca wanted Timmy to be her new boyfriend. His dreams of true love were finally coming true…except that she happened to be Kim K’s greatest rival: the infamous Taylor Swift. When faced with a decision between two terrible outcomes: being the inspiration for T-Swift’s newest album or moving to California, Timmy knew there was only one thing to do: Don a clown suit as his disguise and head down south. Maybe one day, he thought to himself as he left, I will return to the city!